This early outing for Bud Spencer and Terence Hill sees the pair in fine form in a huge spaghetti western with loads of story, characters and tons of action to recommend it from the start. The meaty running time consists of dozens of plot twists, dupes, swindles and betrayals and the film never lets up from a spot-on pacing which holds the viewer’s attention at all times. The three main ingredients for the film are drama, action and comedy and all are served up in spades. Obviously the Spencer/Hill relationship is played for laughs and both actors put in commendable performances; Hill as the Eastwood-style sharp-shooter, the intelligent member of the pairing, and Spencer as the clumsy but lovable oaf who’s as strong as an ox and complements Hill’s character perfectly. 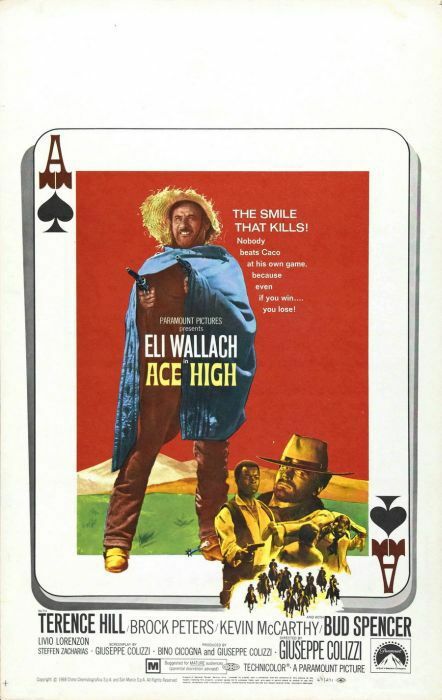 The dramatic angle of the storyline comes in the sweaty form of Eli Wallach, reprising his role from THE GOOD, THE BAD AND THE UGLY as a bandit with a heart of gold who ends up being used and abused by those he considered to be his friends. Wallach’s mission of justice makes up the bulk of the film and once again the actor puts in an excellent performance which hugely enhances the film. Writer/director Giuseppe Colizzi understands the old adage “if it ain’t broke, don’t fix it” in regard to Wallach’s performances so gives the public more of what they have seen already in the Sergio Leone film and the result is no less successful. The script is unusually fine and lends plenty of comic banter and interplay to the scenes between the action sequences. Speaking of action, there is plenty ranging from bloody boxing matches to more traditional shoot-outs, prison breaks, brawls and even a massive gun battle with a machine gun involved. The suspense is gradually upped for the genius climax, set in a dodgy gambling house as our heroes attempt to make themselves some cash by hiding in the loft and cellar and using the fixed roulette wheel for themselves with disastrous results. The film then plays its own ace by introducing arch-villain Drake, acted by American import Kevin McCarthy (INVASION OF THE BODY SNATCHERS) as one of those slimy villains you just love to hate, and the resulting climax is wonderfully exciting. Great use of widely differing music is made throughout the film from epic-sounding vocals to waltzes at the end! Technically the movie is proficient with a more than adequate budget put to good use in the sets and costumes; solid, slightly artistic photography; and well-staged action. One of the best I’ve seen from Spencer and Hill and a film guaranteed to please fans of the genre.